Electricity Distribution Company Limited is looking to recruit fresher candidates for office executives and Technical Assistant posts. WBSEDCL is the organization who are going to recruit for these job profiles in various centres in India. This organization bring smiles to millions of people across West Bengal state with a slew of measures towards providing Quality Power and Customer Service. WBSEDCL has the yearly turnover of more than ₹ 18,000 crores. WBSEDCL assists more than 1.81 crores clients spread over 87,000 sq.km. with more being added every day. Those who are looking to grab a Government jobs in this organization can apply online for this recruitment process. There are total 1179 vacant positions of Executives and Technical Assistant which are going to be filled up through this WBSEDCL Recruitment 2019. We explained more about these Government jobs in WB below in this article. 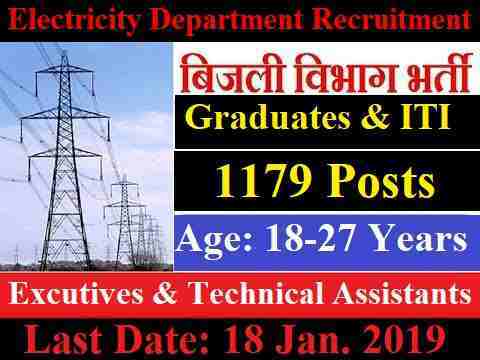 Read it carefully till the end to know more about these Government jobs in Electricity department. Number of Vacancies: 745 Posts. Pay Band: Rs.6,300 – Rs.20,200 +GP Rs.3600 per Month. Number of Vacancies: 434 Posts. All candidates who have passed in their Graduation classes in any stream with 50% marks in aggregate. Must have a computer training certificate. 8th pass or equivalent And must have ITI certificate in one of the following stream: “Electronic-Mechanic/Wireman/ Electrician”. Age Bond: Must have applicants age in between 18 years to 27 years for applying these Government jobs in electricity department 2019. Same age limit for both job profiles which we explained above in this article. Paying Method: You can pay Examination fee through Challan at any branch of United Bank of India. 18th Jan. 2019 is the Last Date to apply. Disclaimer: We took the whole information which we shared above from a PDF file whose link we shared above under Advertisement Here Link. We found this PDF file on to the following website: “https://www.wbsedcl.in”. So all the rights of the above information goes to this website only.